Yesterday, marked the one year anniversary of Sandy coming to live with us. She has been such a great, well-behaved dog. About three months ago, my mom and I started talking about adopting another dog. We love Sandy's laid back Golden Retriever personality, her funny antics, and her sunny disposition. We have been watching animal rescue websites looking at dogs, reading about their little quirks and setting ourselves up for disappointment. 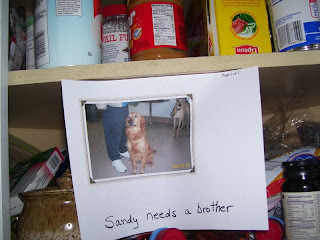 Every time we would bring it up to my brother and stepfather, their answer was the same--Sandy's too spoiled, one dog is enough, our house isn't big enough for two big dogs. We would show them pictures of black labs with goofy big heads, golden retrievers with big sorrowful eyes, smart looking shelties. They remained firm in their answers. NO. We emailed the lady who helped us find Sandy, she works with an organization called Golden Endings. They handle surrendered, neglected, or abandoned Golden's. She knew Sandy's personality and also could offer suggestions as to what to expect, what to be prepared for, things like that. Within a week she told us about an 18 month old male, who had been captured by the animal control officer after running free around a trailer park. His name was Bosley, he had a laid back personality, and he may have been hard to place because he didn't look like a picture perfect Golden. He had gotten caught under a fence or someone tied something around his mouth and he had some hair loss around his nose and up his snout. My mom and I saw Bosley's picture and that was it, he was the dog for our family, the only problem was convincing the guys. The past two weeks we've been dropping hints like crazy. "Two dogs isnt that much more work than one." "Sandy's lonely, she needs a friend." "We can provide a loving caring home for another dog." They all fell on deaf ears. During these two weeks, my mom and I had been secretly buying things for a second dog--a collar, a leash, food and water dishes, Kong toys, etc. We were convinced that Bosley was our dog. When we were still unable to convince the guys, my mom went for the jugular. 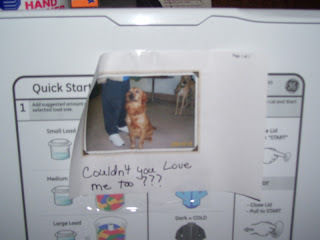 Saturday morning she printed off pictures of Bosley, wrote pleading messages and taped them EVERYWHERE. In the washing machine. In the fridge. In the cabinet. On their car steering wheels. Her ploy, loving called Operation Bring Bosley Home, worked. My brother caved first. And my stepdad caved too. It helped when my stepsister called home and said "How's Bosley doing?" Yes, she was in on the plot too. Tonight, we completed our operation and Bosley came home! He is a small golden retriever and so far all is well. 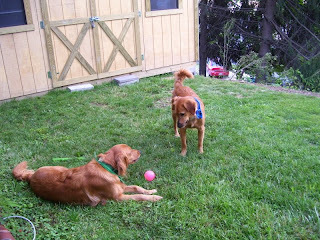 He was very timid at first and Sandy, excited to have a new playmate kept plowing him over like a bulldozer. They played, ran, stole toys from each other and are now zonked out in the middle of the floor. 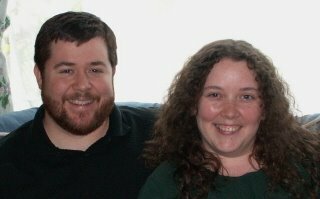 Things are going smoothly now, but any advice on having two dogs will be appreciated! my sister has a golden and he is sleeping with her in my basement right now. I'm a Boxer lover myself, but hers isn't too bad and my Moxie loves having a buddy for a little bit. Good for you for rescuing your dog. when Diana gets older we may consider rescuing boxers. AWWWW!!! SHe is SO cute. I love that idea of posting the photos and messages everywhere, so funny. I may have to try that on my mom. My dad would love a dog, she says no way. Anyways, Bosley is sooooo cute- I am jealous :) I looove golden retrievers, they are the best kind of dog. Yay! They are so cute! My parents have two dogs and we always had two dogs growing up together. You are right that it really isn't that much more work than one. Also they can tire each other out so you don't have to exercise them as much. Just make sure they get lots of outdoor time at a dog park or somewhere where they can romp, and that they don't steal each other's food. But goldens usually have sweet dispositions and I doubt that you'll have issues. 1) I have 3 dogs. If you want them to be OK with each other, let them be. Don't protect one of them, because if you do the other one will be jealous and probably mean to the other. 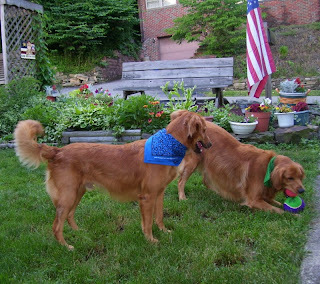 2)I'm surprised your Goldens are laid back. I have a 3-year-old black lab and she's OMG so terrible. She has now stop eating shoes and furniture, but she still steals shoes, she gets crazy in nights. If you say to her "You're a dumb dog" be sure she will be over you. I wish I had a laid back lab. *Sight* Maybe with time. 3) If I had my dad's permission, I would kind of run a zoo. I have been offered some chow-chows and I was totally "I want them, I want them. At least the female." Guess that didn't happen. When I'm buying MY house I will be sure to have a big room for all of my dogs to sleep. I love how your persistence worked out. They ARE adorable together. oh my gosh. They are so cute! Congrats on the new doggy! 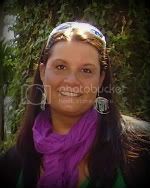 Rachel -- I love all dogs and would love to rescue more if I had the money and the space. 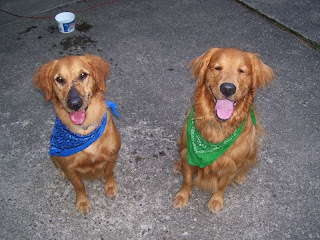 Nikki-- my mom is sly like that and Goldens do have great personalities. Jess--we are working on some jealousy issues now with Sandy, also trying to figure out the feeding thing, thats been the biggest hurdle so far. Andy--thanks for the advice, I have a tendancy to feel sorry for Sandy, since shes the dog that was there first and I dont want her to feel slighted. They both are laid back, not sure if it had anything to do with them coming from prison literally. They were trained by inmates and both spent about 6 months "behind bars" before coming to live with us. Sissy --it was more my mom's persistance, but we are hoping it was the right decision in the long run. Yay! What a cutie! I know how you love Sandy... hope Bosley is just as much fun for you all! Such a cutie! I love the plot! OMG those dogs are adorable! So beautiful. I want a Retriever too but they get so big it might not be practical in the city. Boo.